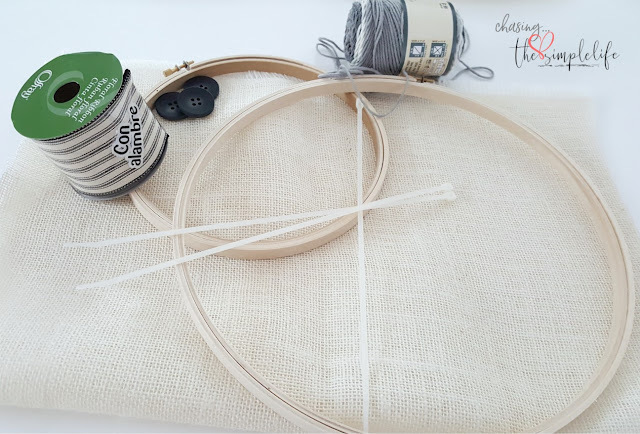 Welcome back to the monthly 10 on the Tenth blog hop and a special thank you to Barb at French Ethereal for hosting this month! 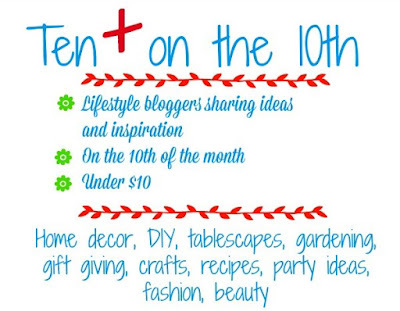 If you aren't familiar with 10 on the Tenth, then you are in for a treat! 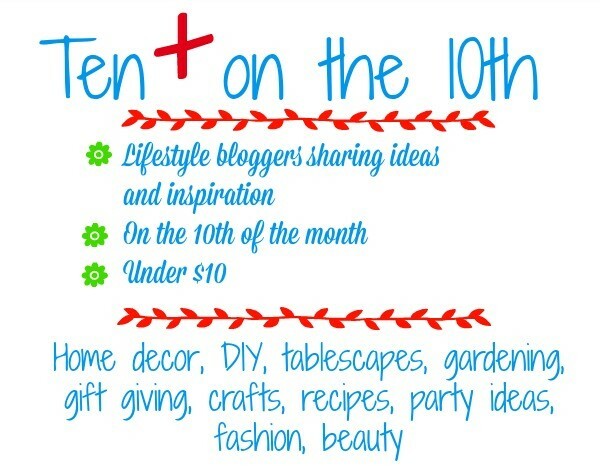 Ten bloggers (more or less) share projects, recipes, table decorating ideas, home decor ideas, etc. for under $10.00. Each month, we have a different theme and this month it is Easter. I chose to create an Easter Bunny Wreath for my front door using embroidery hoops. 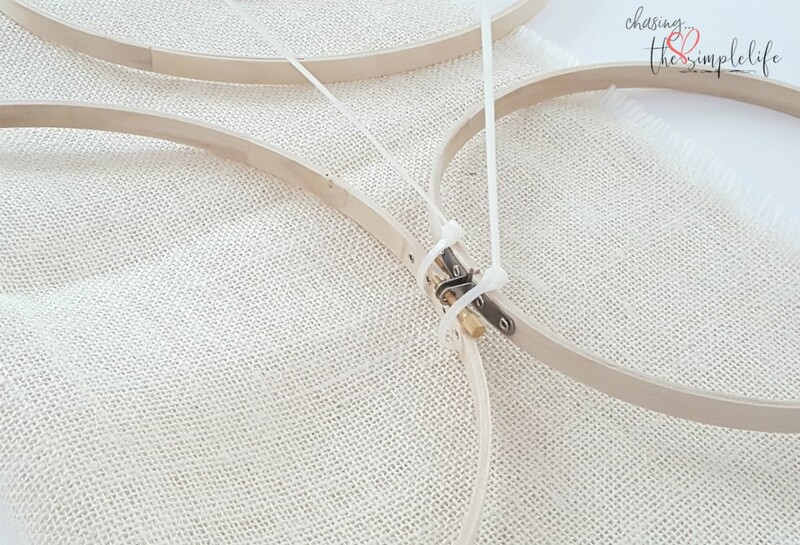 To get started, disassemble your hoops. Use the ones that have the tightening screws first. Join them with either electrical tape or zip ties, making sure you can still access the screws. After you have joined them together (they will be a little floppy), sit them to the side. 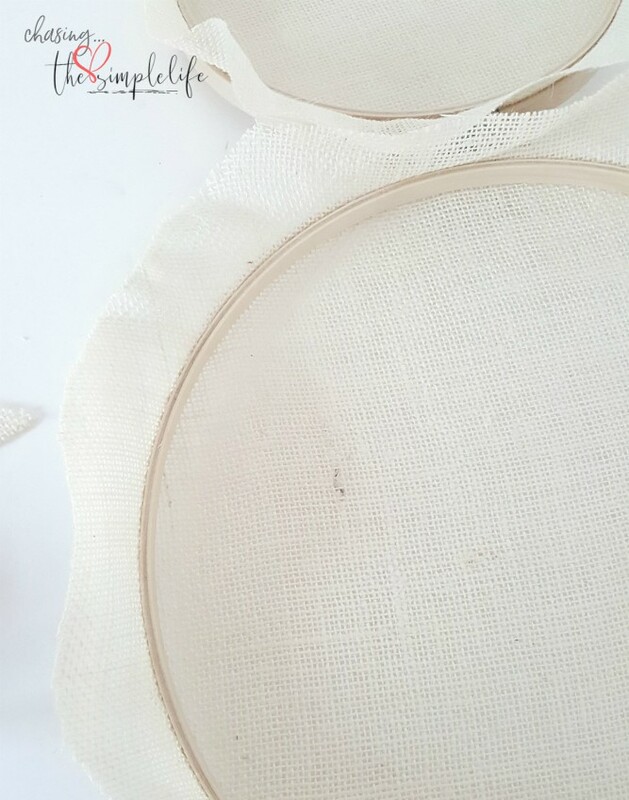 Stretch your material over the other part of the hoop and place it under the hoop with the tightener. It will be snug so loosen the tightener a little if you need to. Make sure your fabric is tight. Do this with both hoops. Tighten the outside hoop using the tightening screw. Turn it over and trim the excess fabric. Now, this is where you need to make a decision...fold the excess fabric over and hot glue it to the inside of the hoop (burning your fingers as much as possible - if you are me) OR cut the material down as close as you can to the hoop. You do not want to be able to see that excess material from the front. After you have trimmed all the excess material, now it is time to decorate. Wrap a piece of ribbon around the "neck" where you have joined the two hoops. This helps hide the zip ties. Make a bow and attach it at the neck. To create the tail, take your yarn and roll off a pretty thick amount onto a cardboard piece 5-6 inches long. Keep wrapping until desired thickness. Slide it off the cardboard and fold the yarn in half. I'm sorry I didn't take pictures of this step. :( Tie off the end with a string and then clip the loops. You should now have a fluffy tail. Cut it shorter if you need to...mine was a little long so I snipped it shorter. Hot glue the tail on the left or the right, it doesn't matter which side. Since my bow was hanging right, I glued the tail on the left. His ears looked a little plain so I glued 3 buttons across the top for some added definition and decided to use some pink paint to give his ears some color. I mixed red/white to get the pink color since I didn't have pink paint. Despite my mess of instructions, this little guy is easy to make. He's a little time consuming but worth the effort if you want an inexpensive Easter decoration for your front door. And maybe I should say "she" since this bunny is wearing such a big bow! Please be sure to visit all of my friends...they have such great things to show you! Benita that is one of the cutest bunny wreaths I've ever seen! Adorable! Susan, thank you so much! I appreciate it! I'm glad it was a relatively simple project...it could have gotten dicey with those hoops! :-) Hugs! Benita that is SO cute! I'm saving this, for sure. Love that big, fluffy bow. Thank you so much Rita! I saved several embroidery hoop projects on Pinterest. You all may be seeing a lot more hoops! LOL…love and hugs! Benita you always have the best ideas! I love that bunny wreath, sooooo cute! Tammy, thank you so much! I will tell you a secret...I get them off Pinterest! :-) I would have never thought to take 2 embroidery hoops and make a bunny...someone else's fabulous idea that I just adapted for me! :-) Hugs!! Thank you so much Pattie! Happy Easter to you!! Hugs! This is adorable, will try it. Thank you so much! I think you will enjoy it, it is not a difficult project! Hugs! This is darling. I love it. Thank you so much Katie! Hugs! Thank you so much Kari! YES, you can definitely make it. It is not difficult. I found the ribbon on discount months ago and didn’t know what I would do with it…when I started making this bunny, I knew it would be good and full! Love and hugs! What always impresses me more than anything is the way you can make a pretty bow. I still tie my shoe laces backward, so I'm hopeless with a bow. Thank you so much Brenda...I had a dear friend show me many, many years ago how to make bows and it just stuck! I can't make them all types of ribbon though, so I stick with wired ribbon. It is the easiest to use! Love and hugs! Good morning sweet friend. This is just too adorable. Love his big bow and that sweet tail. Have a great day today. Thank you so much Kris! 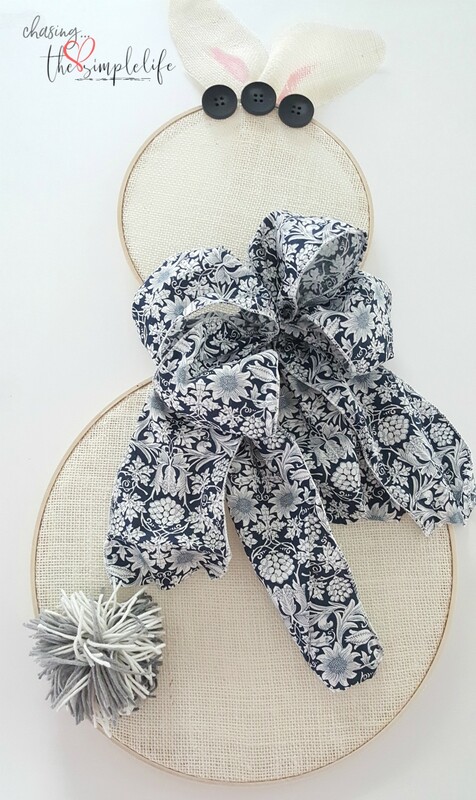 It was a neat little project and I’ve found a lot more of them using embroidery hoops…they may be a staple in my holiday décor from now on! Happy Friday! Love and hugs! Love your Easter bunny craft, Benita!!! Such an easy idea to make and you probably whipped this up in no time, sorry about the burnt fingers. I have found if you use an old chopstick or pencil to push over fabric edges helps with the burned fingers. <3 Very cute bunny and I love her ears!!! Thank you so much Laura! No worries, I don’t think I have it included in my post, but I’m like you…love the extra traffic! Thank you again! Hugs! Thank you so much Carla! Hope you have a great weekend! Love and hugs! I have not seen that before and just love it! And zip ties are like duct tape. Great for a number of things. Seriously so cute. Oh Cindy, you are so right! I couldn't get along without a zip tie!! Thank you so much! 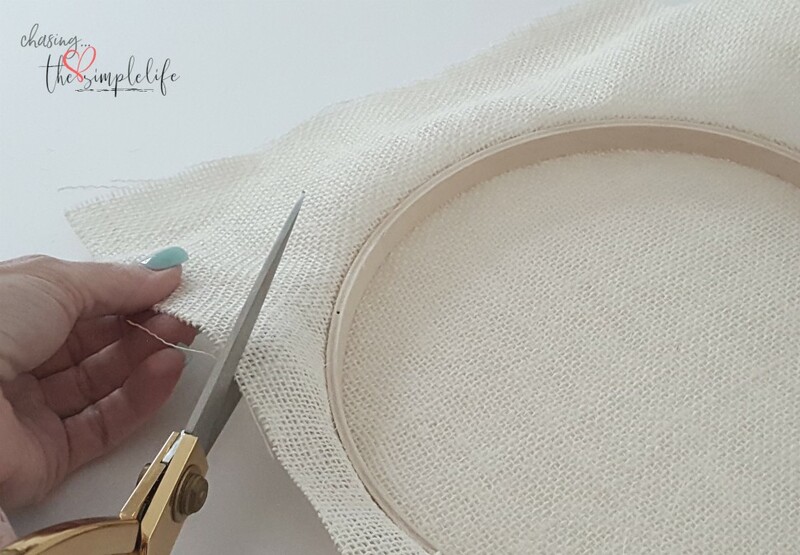 It was on Pinterest...they have so many cool things you can make with embroidery hoops! Have a great weekend! Hugs! Ok this is absolutely adorable. 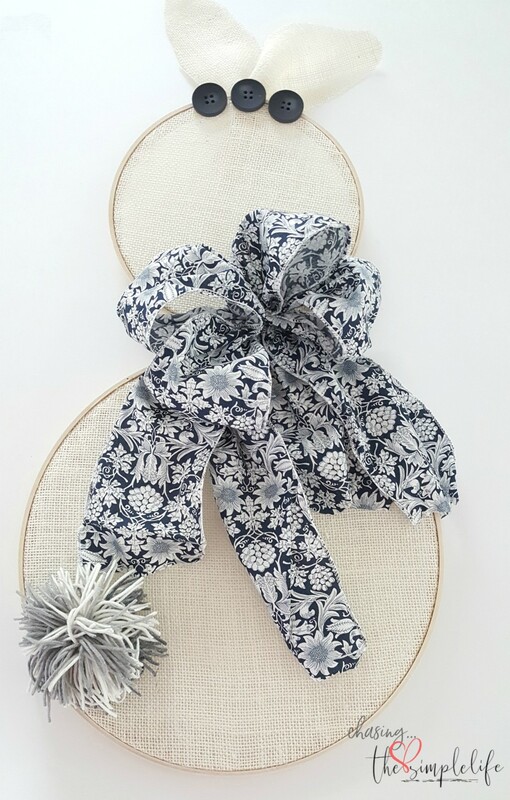 I love the navy and white bow. Thank you so much Lisa! When I found that ribbon it was deeply discounted. I had no idea what I was going to do with it, then I decided to make the bunny for the blog hop and voila...a huge, huge bow! Have a great weekend! Hugs! Such cuteness, Benita! I am now on the look-out for embroidery hoops! Thank you so much Ann! They are pretty inexpensive at Hobby Lobby...that is my go to place for everything! Hugs! Coco, thank you so much! I wish I knew whose idea it was…I saw it on Pinterest and adapted it for me. That’s how most of my creativity happens…LOL Have a great weekend! Hugs! Beyond adorable Benita!!! LOVE LOVE it!!! Thank you so much Jenna! I was pleased with how it turned out. Took a little bit but well worth the effort! Happy weekend! Hugs! Cute, cute, cute!! You are getting so crafty! Thank you so much! It's a good thing I can copy someone else...LOL I found it on Pinterest and changed it up a bit. Have a great weekend! Love and hugs! Benita, this is the cutest Easter DIY project. Easy, but I love that you can personalize it. Pinned for next year. This one will never go out of style. Great to be on the hop with you. Thanks so much Carol! I enjoy projects that are uncomplicated...unlike my master bedroom makeover! LOL I like that I can use it year after year also. Thanks so much...love participating in these hops with you as well! Hugs! Dang, I wish I were hosting this week's Homestyle Gathering! This is so stinkin' adorable. I actually said it out loud in My Wee Abode! LOVE! Pinning! Thank you so much! It was a great project and I plan on doing more projects using embroidery hoops. Thank you for pinning also! Have a great day! Hugs!